This funky bottle is Fujizakura Heights Weizen, brewed in Yamanashi, the prefecture immediately west of Tokyo. It seems that this beer is marketed towards women according to the Fuji Kanko Kaihatsu homepage as it is unfortunately labelled as easy drinking “even for women”. Blurgh. 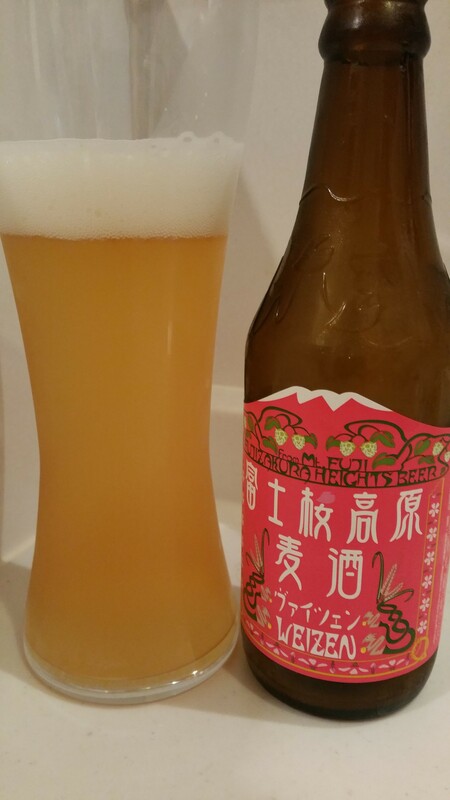 Fujizakura Heights Weizen is brewed using 50% more wheat than usual weizens. A beer for women. Damn hate that marketing line. Fujizakura Heights Weizen smells like sugar and spice and all things nice. Because it’s aimed at women. PR gumpf and silliness aside, Fujizakura Heights Weizen smelt amazing. The aroma reminded me of those malt milkshakes made with fresh bananas in the those tin cups that could be found in American diners. Simply beautiful. The cloves also came through but add a little spice to the beer that was dominated by the malt and bananas. The body was a hazy golden-yellow colour but a meagre amount of head for a weizen. Fujizakura Heights Weizen doesn’t attempt to be something it isn’t; it is a weizen and it does it very well. The banana milkshake aroma followed through to the taste, combined with a subtle wheaty kick and a gentle spice aftertaste. It all wrapped up with a bubblegum aftertaste that didn’t have me blowing bubbles but left me feeling refreshed. It’s a bold, over the top weizen that just seems to hold it all together. Fujizakura Heights Weizen is one of the best weizens I’ve ever had. Superlatives aside, it’s good and deserves being sort out; on draught or in bottle form. I agree. It is a great weizen. Much better than all the German weizen beers you can get here in Japan (Schöfferhofer, Franziskaner, Erdinger,…) A few days ago I noticed that the Meitetsu department store in Nagoya now stocks Fujizakura, I bought all the weizen bottles they had!